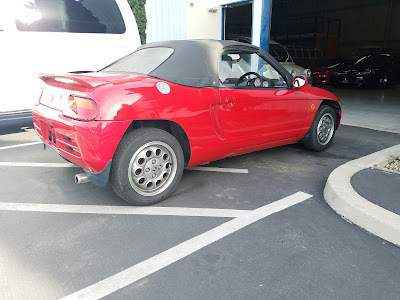 The Honda Beat is a rear wheel drive, mid-engined two-seat roadster kei car produced from May 1991 to February 1996. The Beat was the last car to be approved by Soichiro Honda before he died in 1991. The total number of cars produced was around 33,600. Most of the production (around two-thirds) occurred in the first year, and then production and sales fell drastically. The design of the car originated from Pininfarina, who then sold the design plan to Honda. The Beat was one of many cars designed to take advantage of Japan's tax-efficient kei car class. There were two mainstream models of the Beat (the PP1–100 and the PP1–110) and a couple of limited edition versions. Variations on the first model were just cosmetic updates. Only the second model had any real mechanical differences. All cars were offered with the option of a driver's side airbag. The car was sold exclusively in Japan at Honda Primodealership sales channels. In typical Honda fashion, the Beat's engine did not utilize a turbocharger or supercharger. The 656 cc (40.0 cu in) engine was modified with the MTREC (Multi Throttle Responsive Engine Control) system, with individual throttle bodies for each of the three cylinders, to produce 64 PS (63 bhp) at 8100 rpm with an electronically limited top speed of 135 km/h (84 mph). Only a manual transmission was available. The MTREC design would filter down to the 1993 Honda Today kei car. Standard Equipment: air conditioning, power windows, 3-point seat belt, sun visor, front stabilizer, front laminated glass, side-toughened glass, halogen head lamps, soft top, steel wheels. 1992.02: The Beat Version F features the Aztec Green Pearl color and alloy wheels. 1992.05: The Beat Version C features the Captiva Blue Pearl color and white alloy wheels. 1993.05: The Beat Version Z features the Blade Silver Metallic color or Evergrade Green Metallic color, three black gauges, mud guards, a rear spoiler, exhaust pipe finisher, and alloy wheels. In order to extract higher horsepower from a naturally aspirated engine, Honda modified the E07A with a MTREC (Multi Throttle Responsive Engine Control) system, placing individual throttle-bodies on each of the three cylinders. The system modified the air-fuel ratio of individual cylinders based on RPM to give sharper throttle response while also maintaining a stable idle.